We started our morning by giving hoteliers Donna and Barry a report on the Pirate Room after last night’s shakedown cruise. The room needs only a few tweaks, such as a towel hook for the bathroom. We had a nice conversation. Both are Harley riders who share our new friend Richard Henry Lee’s affinity for those who travel on fewer than four wheels. They explore back roads and do not ride at night (unseen potholes cause motorcycle wrecks). Barry, a proud Navy veteran, is very conscious of ecology, protecting nesting birds and old-growth trees, and lamenting “progress” such as a local desalination plant that dumped salt into the marshes. The Lodge, which Barry rescued from neglect, is a labor of love; it’s not an easy way to make a living. 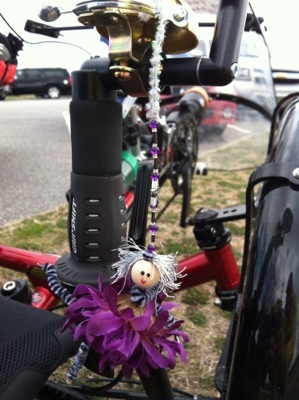 From Grandy, we rode south, then turned east to cross the 3-mile bridge to the Outer Banks. 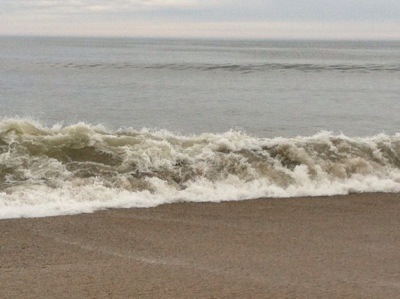 The Atlantic shore is striking. 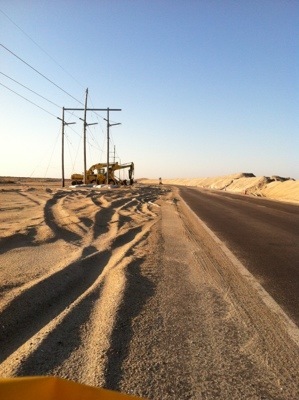 Barrier islands move; sand was heaped by recent storms, and earth-moving equipment was clearing the roads. 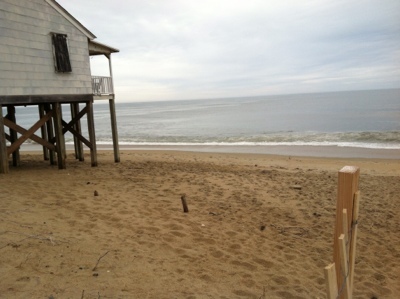 One wonders how long these seaside houses will last. Several people along the road asked Jeffrey about the Ride and about human rights. One man flagged us down to ask if we needed a place to stay. This is the America we have found on our Rides – not just here and there, but everywhere. 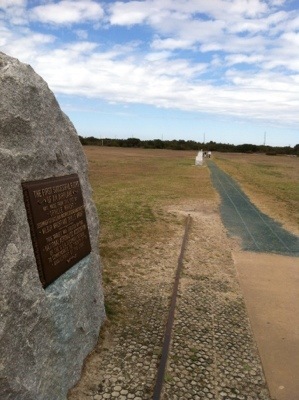 At Kill Devil Hills, we stopped at the national park to visit the site of the first airplane flight. 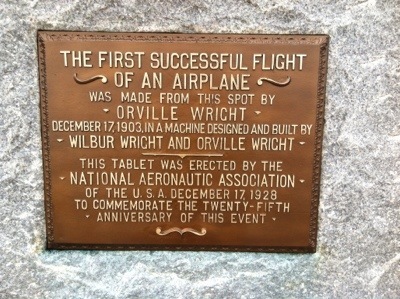 A few people still alive are older than the airplane. It was a wonderful invention, and like all inventions – including laws and nation-states – it has been used well, and badly. 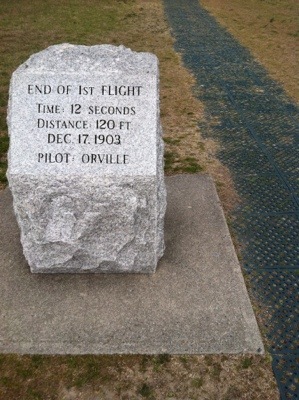 The hilltop monument is about 450 feet from where the first flight took off; wind had moved the sand that far between 1903 and the late 1920s. When Jeffrey came out of the park museum, he found this doll hanging from the Sprint’s brass bell. It probably was a gesture of encouragement. Jeffrey rehung it from our flagpole. We continued south. We saw a lot of wildlife – muskrats, birds, turtles, and critters we could not identify – but most of it fled when we approached. 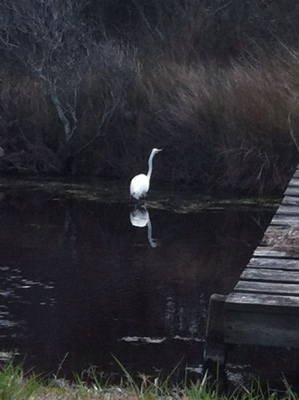 This egret held still. 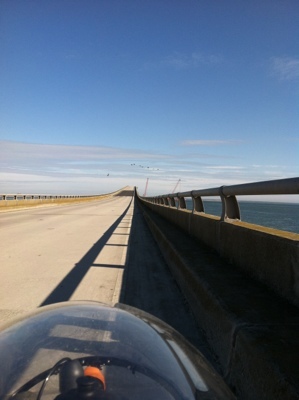 We crossed another long span, the Oregon Inlet Bridge, to Pea Island. 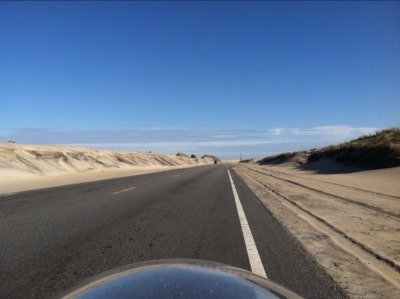 Just over the bridge, only one lane was open due to sand having drifted over the other lane; traffic could move in only one direction at a time. In the line of cars waiting to go back to Kitty Hawk was the man we met yesterday who had worked at Weil, Gotshal; he called out to Jeffrey as we zoomed by! Here are some views. We stopped at the Sea-Sound Motel, a family establishment run by Sharon and Frank. They were taken with the Ride, talked with Jeffrey about refugees, and gave him a generous discount on our room. (We never ask for one.) More friends and supporters for HRF. After dark, we looked at the sky. The stars and planets are remarkably bright at the edge of the continent, away from car exhaust and city lights. They are beautiful, and when one thinks about what they are and how far away, it’s hard not to question the rat race and the pettiness with which we treat fellow humans who happen to have been born abroad. 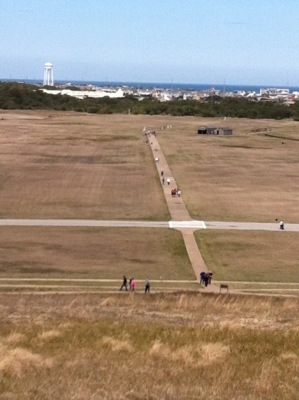 This entry was posted in Asylum, Bicycle Touring, Human Rights, Immigration, Outer Banks, Tricycle touring by Joey. Bookmark the permalink. 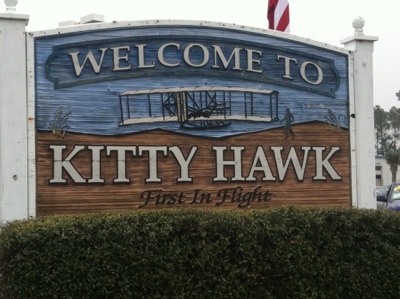 Yea for the Kitty Hawk stop and pics…Your probably pedal faster than their original flight travelled. No ‘carbon foot prints” from either of you all (y’all) either. I love your blog as well as the cause. 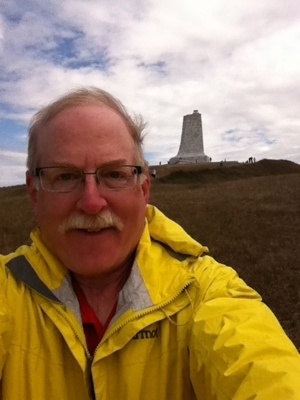 Nancy’s sendoff blog addressed my fears… yet the goodness of humanity astounds me on these trips of yours. Reminds me of a boook called The Kindness of Strangers. A man went cross country with no money relying solely on that. I am on awe of your LIVING your idealism so fully.